Today’s applications and infrastructure are constantly evolving and continue to span multiple environments. As the complexity of the environments increases due to cloud and microservices initiatives, getting full stack visibility into these dynamic environments becomes more difficult. According to a survey by Enterprise Management Associates (EMA), most enterprises are struggling to find the right tools to manage their environments and over 65% of the enterprise organizations have more than 10 monitoring tools. Despite these investments, it is still left to the user to root-cause issues by assembling teams, processes, tools and manually piecing together siloed data fragments. This is quite a challenge considering that the modern IT environment is subject to constant change. And that's exactly what Artificial Intelligence for IT Operations (AIOps) is trying to solve. In this post, I will give you a brief introduction to AIOp and why you should care about this new movement. 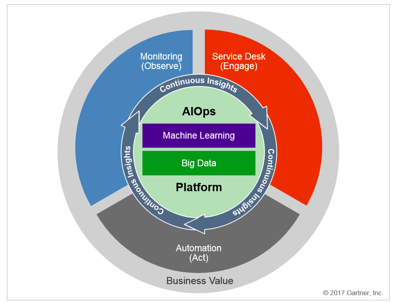 AIOps platforms represent the evolving and expanded use of technologies previously categorized as IT operations analytics (ITOA). It's so new that it doesn't even have its own Wikipedia page. According to Gartner by 2019, 25% of global enterprises will have strategically implemented an AIOps platform supporting two or more major IT operations functions. "AIOps platforms utilize big data, modern machine learning and other advanced analytics technologies to directly and indirectly enhance all primary IT operations functions with proactive, personal and dynamic insight. It enables integration with other applications via application programming interfaces (APIs) allowing for a vendor-agnostic data ingestion capability. AIOps platforms can thus seamlessly interact with IT operations management (ITOM) tool sets because of the ability to deal with data from any tool irrespective of the data type." How do I monitor the health of my dynamic IT landscape with zero blind spots? How can I predict failures or react ‘fast and furious’ to solve an issue? How can I get visibility across private clouds, public clouds and on-premise environments? How can I provide more efficient and stable infrastructure? With AIOps platforms, enterprises will be able to centralize all their data in one place and make sense of it instantaneously. You’ll gain full stack visibility and be able to understand how the business, applications and all underlying infrastructure are related to each other. This real-time visibility will make IT Operations teams more efficient, solve problems faster and become more proactive. How is StackState Delivering AIOps? From on-prem to cloud. From legacy to microservices. Proactive or reactive. We have you covered. StackState is able to automatically discover, map and monitor your entire IT landscape across teams and tools. Use StackState to find the root cause of your problem within seconds and proactively prevent issues from impacting your business. Say goodbye to ‘finger pointing’, break down silos and collaborate with only the right people to solve an issue quick and easy. Our AIOps technology is built for today and ready for tomorrow. It gives you the confidence to reduce operational costs, drive speed of delivery and boost your current IT management investments. Interested to learn more about StackState? Visit our website or download our Guide to AIOps. How to help IT Operations & DevOps deliver efficient and high quality services - with zero blind spots.